Spring has sprung at Newbury Elementary School! There’s been a lot of planning for our “lab gardens” here at NES. Each classroom has adopted a garden or raised bed. Our 5/6 team has committed to keeping the permaculture gardens in shape and also the perennial beds around our historic Common. The K/1 team plans to plant a “5 senses garden”, and a 1/2 class is planning a butterfly garden. 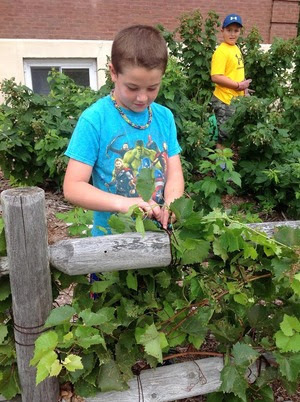 In enrichment, we host gardeners from grades K-6 who have been making good choices in school. This allows us to work with small groups as we work in the garden spaces. Students in the 3/4 team have been interviewing our culinary guru, Chef Paul, to plan and plant vegetables that will be used to support the school lunch program. Also, 3 beautiful laying hens have made their new home in back of our school. K/1 students have enjoyed learning about their quirky habits and finding eggs each day to use in classroom projects. Taste of Tunbridge a Huge Success!